Nurse Sage Nichols life changed when she lost her favorite patient and inherited a bed and breakfast in a town she didn’t know existed. 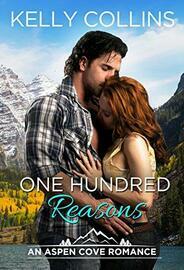 She traveled to Aspen Cove intent to sell so she could hurry back to her life in Denver. Little did she know, she was about to find everything she ever needed in the tiny mountain town with a big heart. Sage found herself in a place where caring for your neighbor was a way of life. In her case, that happened to be surly Cannon Bishop, the man of her dreams. Cannon Bishop was a man who learned long ago that hope was a dangerous thing. Closed off from the world after a family tragedy, Cannon lived a lonely life as the owner of Aspen Cove’s only bar and son to the town drunk. When Sage Nichols breezed into town, she offered the possibility of more if he’d only open his heart. Cannon's protective walls tumble and suddenly a brighter future of healing, hope, and peace was possible…if only Sage would stay.